If our universe’s timeline had unfolded in a slightly different permutation, Troy Nickerson would currently be directing a play about a group of white supremacists from North Idaho. But that’s not how things played out. Instead he’s overseeing Hello, Dolly!, a lighthearted warhorse musical that might very well be the antithesis of God’s Country. The catalyst for this chain of events wasn’t exactly a happy one. It hit back in November with the death of local actor and director Lance Babbitt, a loss that left the region’s theater community in mourning and the Civic without a skilled director for its season finale. More poignantly, Hello, Dolly! had been one of Babbitt’s all-time favorite shows, so it was vital that any replacement do justice not only to the musical proper but to his memory as well. For the Civic, that made Nickerson a clear choice. Before he could commit, though, Nickerson had to step back from God’s Country without leaving Stage Left Theater in the lurch. He called Tia Wooley, Stage Left’s managing director, to break the news. “She immediately understood,” he says. That theater then began its own search for a replacement, and Nickerson returned to directing the production he was working on at the time, Who’s Afraid of Virginia Woolf?, whose tension and disquiet makes it a closer dramatic cousin to God’s Country than a beloved musical comedy about a scheming matchmaker and an eligible half-millionaire. “It’s been whiplash going from Virginia Woolf to Hello, Dolly!,” he says. Fortunately, that abrupt transition has been smoothed by another cosmic blip, this one much more auspicious. It happened last summer when Robbi Starnegg and her husband were still living in Salem, Oregon. “We came up to Spokane on a whim on a weekend last July and fell in love. We decided instantly, ‘This is where we’re moving,'” Starnegg says. Soon after settling here, she met longtime Civic costume designer Jan Wanless and became involved with the venue. Starnegg, it turns out, is a former Equity actor who’s worked for professional and community theaters from California to Maine. 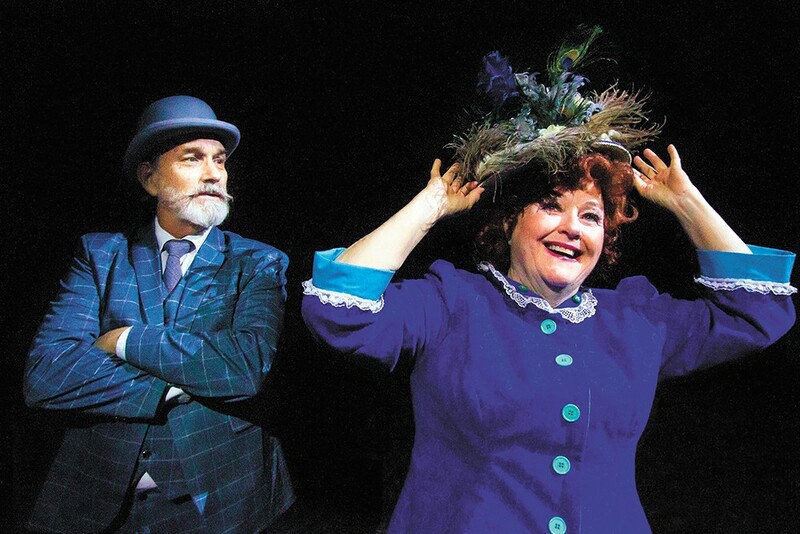 After “semi-retiring” from the professional circuit, she was on the fence about auditioning for a role in Hello, Dolly!, not least because the newcomer felt that the “phenomenal” local talent pool would offer some stiff competition. “I had volunteered to help with the Dolly costumes, and then I thought, ‘Oh, these auditions are coming up. I’m just going to try. I’ll sing a song and we’ll see.’ And by gosh, by golly, I got a call about Dolly,” she says.